TZXDuino is a cool Arduino project that is basically a standalone hardware cassette audio playback unit for old computers. 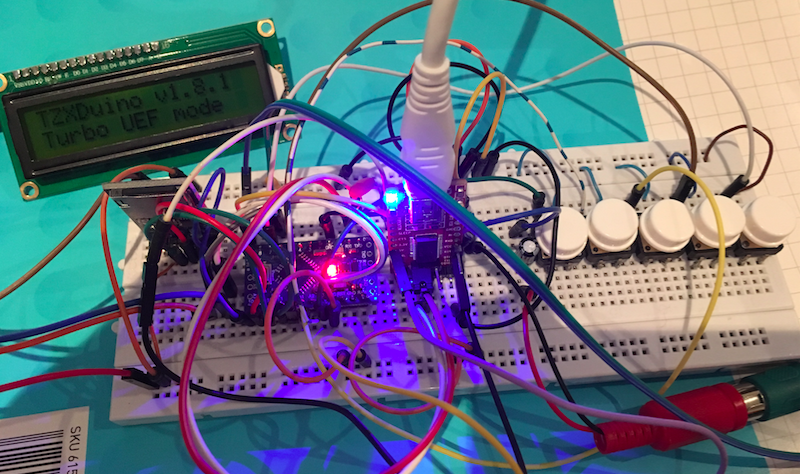 You hook up an Arduino, a microSD card adapter, an I2C LCD display and 5 buttons. Load a microSD with lots of game dumps, and hook that up to the audio input of your ZX Spectrum or Amstrad. With the buttons and LCD you can scroll through the files on the SD and basically ‘hit Play’. So it can play the most common ZX Spectrum tape dump formats ; TZX and TAP (plus a few for the ZX80 and ZX81), and CDT format (for the Amstrad) as it’s basically the same as TZX. It can’t play UEF tape dumps though. UEF is the tape dump format used by the BBC Micro and Acorn Electron. My current way of loading UEF files on my Electron is to use freeuef-alsa on a linux PC with its audio out hooked up the Electron. Every time the Electron pauses the cassette I have to hit space on the PC, then wait a bit and press Enter to get it going again. It is not ideal. TZXDuino outputs square wave tape audio. Most documentation for the Electron say you need a nice sine wave … but I thought it might not matter that much … and indeed that’s what I’ve found. The Electron does not care that its getting a square wave. If I was really keen I would figure out some set of resistors and capacitors on the Arduino audio output to convert the square wave into something a bit more like a sine wave. There are heaps of ‘chunk IDs’ that are documented in the UEF format definition. I think I only understand about 3 or 4 of these chunks. This seems to be enough for most games so far. So if you don’t mind gunzipping all your UEF files (which is a pretty simple script on a linux/Mac system), then it works pretty well. You can use an Arduino Uno, but I used an Arduino Mini and have an FTDI adapter sticking up to simplify programming it (which I won’t need when I solder it all together). Wiring is on the TZXDuino page. They talk about using a small amplifier from the output on D9, but I thought the Arduino itself can probably drive a headphone at least and that might be enough. So I just have this resistor/capacitor setup with a 200R variable trimpot to control the volume. Generally, once I’ve found the ‘sweet spot’, I never adjust the volume ever again. For reference if the trimpot split is 40 ohms (on the arduino side) and 160 ohms (on the ground side), it seems to work pretty well for me. A huge plus with TZXDuino is that D6 can be used for motor control. The Electron has two pins on its cassette interface for motor control. They just go to either side of a relay. Just tie one to ground. And the other goes to D6. 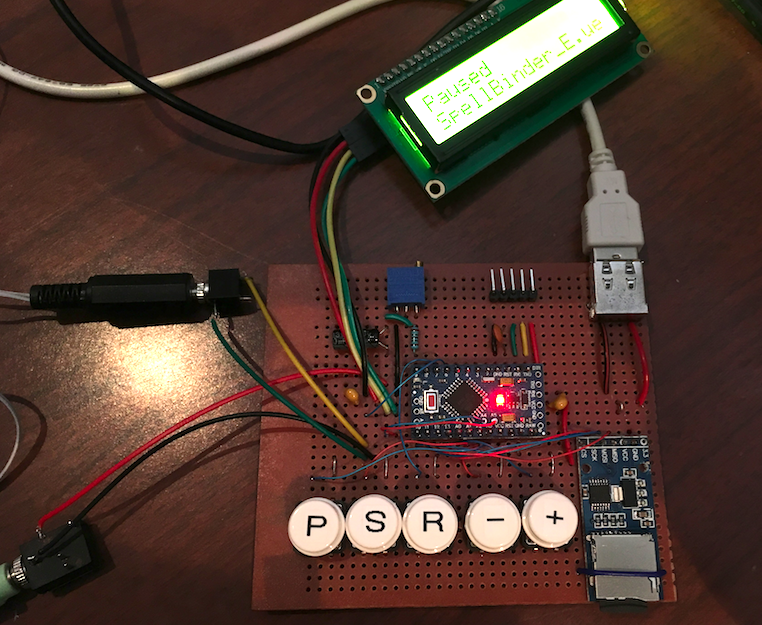 Now when a cassette loader needs to pause playpack, TZXDuino will pause (and you will see it in the LCD display). Essentially the pulse lengths are in microseconds. For example a 1200Hz wave used for a 1200 baud zero has a cycle time of 1/1200 = 833us . Divide that by two and you get 416-ish which becomes the UEFZEROPULSE setting. Similarly 2400Hz is used for a logical one. 1/2400 = 416us. Divide that by two and you get 208us which becomes the UEFONEPULSE and UEFPILOTLENGTH. If you have the BBC/Electron motor relay hooked up to the Arduino, the audio playback will pause and start playing again automatically. Otherwise, you’ll need to wait for a click of the relay, press Play to pause the playback, then when the Electron says ‘Searching’, you press Play again to continue playback. This entry was posted on Sunday, March 4th, 2018 at 8:14 am	and is filed under retrocomputing. You can follow any responses to this entry through the RSS 2.0 feed. Both comments and pings are currently closed.